The outsider often sees things differently. From a standpoint rooted in the European critical tradition, the Italian scholar and critic Carla Sassi offers new, refreshing insights into the nature of nationhood and identity as represented in and through Scottish literature from the earliest times to the present day. 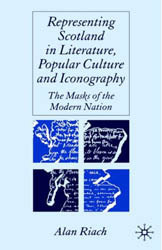 After the initial exposition of these anomalies, Sassi in the following eight brief chapters explores ‘this vast and extremely challenging subject’ and unravels Scotland’s ‘uniquely problematised heritage’ as it relates to the ‘equally problematic ideas’ of nation and identity. As one would very much expect of any literary history, these chapters naturally include discussions of ‘the Scotlands of the past’; ‘the dislocations and relocations’ of the eighteenth century; the ‘re-invention’ of Scotland in the following century; and the literary Renaissance of the twentieth. But it is good to say that Sassi’s is not ‘just another history of Scottish literature’. This is because she brings fresh perspectives to the subject, particularly in the later chapters, where ‘unfamiliar sights begin to appear on the road’. Here, Sassi concentrates on how some contemporary Scottish writers have moved away from or even beyond the perennial question of ‘definitions’ of nation and identity to ‘redefinitions’. 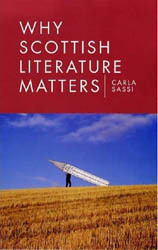 Though Sassi is not the first cultural or literary critic to have noticed this shift, she takes the debate into new territory when she asks whether this shift of emphasis proclaims ‘a distinctively Scottish contribution to the re-definition of identity’ where ‘the problematisation of national identity has, inevitably, encouraged the questioning of wider identity issues’. It was Robert Louis Stevenson, who wrote in 1883, that ‘Scotland is indefinable, it has no unity except upon the map’. Sassi argues that it is ‘this idea of indefinability that goes hand in hand with the increasing loosening of the relationship between the national space and identity which has characterised the second half of the twentieth century in many European countries. Scotland, in this respect, is no exception.’ An un-apologetically slim volume, Sassi’s insightful study takes an imaginative and refreshing approach to Scottish literature in a post-modern age and provides a useful and highly readable contribution to Scottish literary studies. In Representing Scotland in Literature, Popular Culture and Iconography, Alan Riach extends his sights to include a critical consideration of visual art, music, theatre, film, television and comics alongside canonical literary texts. The result is admittedly something of a tour de force, but also something of a disappointment. Encyclopaedic as Riach’s knowledge is, and impressively wide his cultural sympathies, the essays that make up this book do not seem to flow into each other or make any cohesive, or coherent, argument. This is a pity, as Alan Riach does have many interesting and perceptive comments to make, and though he writes with great erudition and passion about Scottish literature and culture, these essays have in effect been cobbled together, from ‘work that has appeared in earlier forms in various journals, in the form of conference papers, in discussions with individuals and in classes in universities in New Zealand, Scotland and elsewhere’, without any seeming cohesion. …?’ Not that he proposes to examine or analyse every existing genre, and thankfully we are reassured when he writes, ‘if the selection of texts I have made is intended to represent certain aspects of the evolution of Scottish cultural production, I should emphasise that Representing Scotland is not and could not be comprehensive’. And this is where one of the book’s problems lies: though Riach in his critical study systematically considers a great number of genres and numerous individual ‘texts’ within each genre, and explores these ‘forms in which aspects of Scotland’s identity have found expression’, he seems to have set his sights too wide, and simply does not do full justice to the multi-numerous cultural productions in his purview. Ostensibly a hugely learned work, and a study that could be said to be, in its own way, sui generis, overall Representing Scotland in Literature, Popular Culture and Iconography does not really achieve what it sets out to do.